Star Bits are points you can earn by posting on the forum you can exchange them for stuff like username changes,custom name color,custom rank image,etc. you can read more about them and see how much stuff cost here. How do I exchange Star Bits? Just send me a private message with the username,name color, or rank image you want and I will change it then deduct the amount of Star Bits that it cost! How do I favorite and unfavorite a forum? 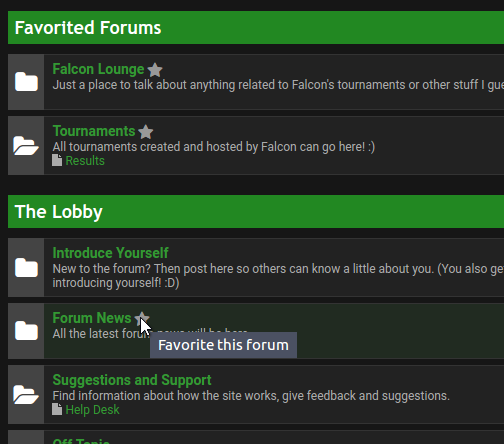 To favorite just hover your mouse next to a forum's name and click the star that comes up! How do I add a custom emoticon? 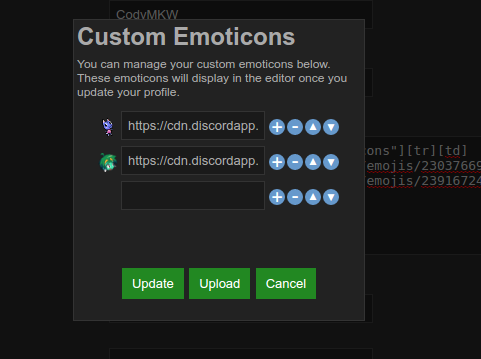 To add new emoticons, go to your edit profile page, click the textarea for the "Custom Emoticons" field, and follow the steps below! Click the "Update" button to update the textarea. Your new emoticons should now be available!